Murrieta's Well Archives - Write for Wine: It's Wine O'Clock Somewhere!Write for Wine: It's Wine O'Clock Somewhere! If you’re looking for good value red wines for the holidays — for your dinner table or for a hostess gift — look no further. Here are four that we recently tasted and recommend: one from Washington state and three from Livermore Valley, located just east of San Francisco. This unique red blend not only drinks well but also has a great label that is a perfect hostess gift. This Livermore Valley wine blends 31% Petite Sirah, 29% Petit Verdot, 27% Cabernet Sauvignon, 8% Malbec and 5% Cabernet Franc, and pairs well with roasted and grilled meats, dishes with red sauces or rich cheese. Marietta’s Well is one of California’s original wineries, propagated in 1883 with vineyard cuttings from Chateau Margaux and Chateau d’Yquem in France. Need we say more? 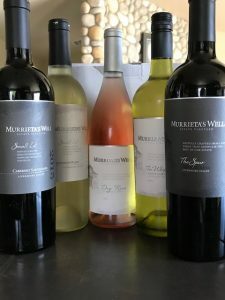 Oh, one more thing — Murrieta’s Well is owned by Philip Wente of Wente Vineyards, the country’s oldest, continuously operated family-owned winery. This estate-grown Cabernet Sauvignon combines 76% Cabernet Sauvignon with 9% Petit Verdot, 9% Petite Sirah, 3% Malbec, 2% Cabernet Franc and 1% Merlot. This is a great everyday wine that is well balanced, with a depth and intensity that showcases the character of the grape. Just like Murrieta’s Well, vines at Wente Vineyards were planted in 1883. Today the winery draws from approximately 3,000 acres of sustainably farmed Estate vineyards. TateDog’s slogan is “Great artisan wines at nice prices,” which perfectly describes the 2010 Cabernet Sauvignon. This flavorful, award-winning wine has a beautiful nose with a long finish. While medium-bodied, it pairs well with a ribeye or stands alone without food. Launched by Ste. Michelle Wine Estates in 2005 as a restaurant-only brand, 14 Hands introduced “The Reserve” label of wines sourced from the Horse Heaven Hills appellation in Washington state in 2012. This is one gorgeous wine, which received 92 points from Wine Spectator. This beauty would also pair well with a ribeye or a rich mushroom tart. And if you are in Prosser, stop by their new tasting room, which opened earlier this year. Thank you to these wineries who kindly provided us with samples of their wines. Our sample policy can be found here.